Some might say that Ross is so skinny that any walleye he holds will look big in a photo. On the contrary: Those big, fat fish he routinely catches would make anyone look thinner by comparison. MWO: Ross, we’ve known each other a long time, but don’t see each other often because we live about 800 miles apart. Even so, early on, I recognized you as a major upcoming influence in the walleye industry as an angler, guide and especially as a communicator. When and how did you first break into the fishing industry? Robertson: I started working in a tackle store when I was about 14 or so, real close to my high school in Toledo. That’s how I started meeting folks the likes of Jim Fofrich Sr. Jim’s dad was my dad’s barber. I started fishing with Jim a little bit. And then with all the anglers coming into the tackle shop, you just start meeting guys like Gary Roach. Roach taught Fofrich about jigging on the reefs, because nobody jigged on the reefs on Erie in the late ’70s and early ’80s. Information distributed slowly back then. We used to have to wait months to get the inside scoop on the tournaments in Walleye In-sider to find out what happened at Professional Walleye Trail (PWT) events. Nowadays with the internet, you know right away. MWO: Back in the early ’80s, Gary Roach was our initial contact to Lake Erie and charter captains like Jim Fofrich Sr. Roach showed local Erie anglers how to jig. They taught him about casting weight-forward spinners. 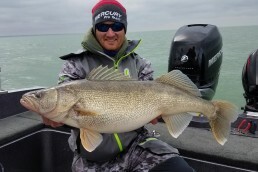 Fofrich soon became our main contact to the Lake Erie walleye fishery. Everyone learned from each other. Ross Robertson with Gary ‘Papa’ Roach. Robertson: The guy that I consider a mentor, who really taught me a lot of stuff, was Dave Hanson from Bemidji, Minn. I traveled to a lot of professional fishing events through high school and college with Dave—PWT, RCL and so on. Dave really taught me the ropes. Especially about fishing with spinners. They used to call Dave Hanson “board man” because he won some early tournaments trolling large salmon-style planer boards, snap weights and that stuff. Dave was an innovator, not just a follower. I learned a ton from him. They say that timing is often the key to life. Offshore Tackle was starting to develop a lot of equipment for the open-water trolling scene and suspended fisheries. 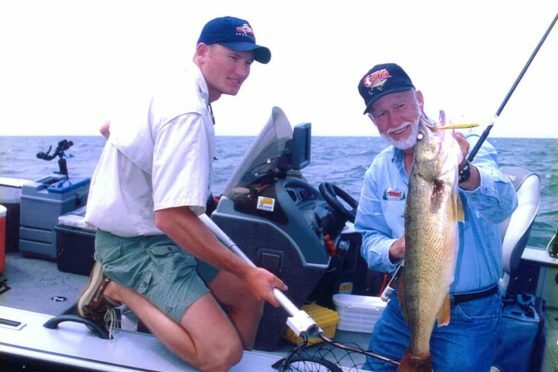 The Professional Walleye Trail got guys thinking that you could run a “small boat” like a 20-footer, instead of the traditional 27-foot SportCraft popular on Erie at the time for charter captains like Fofrich Sr. and Jimmy Jr. It helped me get a little bit ahead of the curve, write some features, and dig my toes into the industry. I was about the first guy to start guiding out of a small boat. MWO: Interestingly, what you guys called a small boat on Erie back then was a 20-footer, which we considered to be large boats back in the Midwest. It’s all about perspective. Robertson: Everything is relative, I guess. I learned early on that, to make it in the fishing industry, nothing is ever easy. You have to be persistent. You have to love it. And you have to stay ahead of the curve. If I was operating at the same level in any other industry, I’d probably be making three or four times as much money, but I do love what I do. There’s a lot of networking going one. As we transfer from print to electronic media, everything keeps evolving. Every 3 or 4 years, you have to reinvent yourself to stay ahead of the game. Birds of a feather flock together. Back then the three guys that helped me a whole lot were Dave Hanson, Jim Fofrich Sr., and Gary Roach. Put yourself around the right people. If you have a passion for fishing, you might make it. You have an opportunity, if you’re willing to work hard and do what it takes to succeed. I probably learned more about the fishing industry from Roach than anyone else. Most of the time we fished together, I was probably yelling at him, because he hated trolling, and that was kind of my deal. He taught me a lot, though. He’s a thinker and an innovator, a product designer. He taught me that, no matter how many fish you catch, you still have to have the business thing going, because you don’t get paid to cast a line. Very few people get paid to fish. Maybe Kevin VanDam does, but you have to have a balance of fishing and business. Hopefully each is as good. MWO: How old were you when you started traveling with Dave Hanson to early walleye tournaments? Robertson: I believe I was 17, about 1996-97. 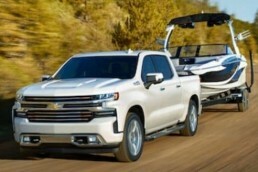 I used to be called “the kid.” At boat launches, I was the one who drove the boat around while the angler parked the truck, because I didn’t have a driver’s license. The other day at a boat launch, somebody called me “old man.” I guess things are coming full circle. I started fishing with a couple of guys, and did pretty well. We won a couple of derbies. Prefishing with those guys, who always needed a couple of extra rods, you built friendships and networks. I might have been 20, and here I am, already being published in In-Fisherman and FLW Outdoors. Getting that opportunity early on really helped me break into the industry. MWO: I remember telling FLW at that time, when they were looking for someone to write material on the Great Lakes, that you gotta talk to Ross. He’s at least among the best anglers out there, but he’s also the best communicator, who could write, speak and get ideas across to people when it came to the big-water trolling game. MWO: I noticed that you used to call Roach “Papa” all the time. Robertson: Todd Frank and I did. We were young guys, and Gary showed us the ropes. We also called him “Rotten Roach” at times, like a bunch of his buddies did. But he really watched out for us in our travels, and showed us a lot. But for 10 years, I nearly always called him Papa. Thanks in large part to him, I realized right away how I might be able to make a living around the walleye industry. MWO: You need multiple incomes, from fishing, sponsors, seminars, writing, communicating. 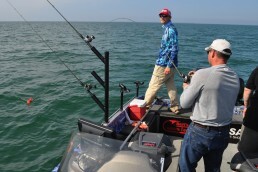 The best advice is to stay in school, learn to be a communicator, and then catch fish and then go pro, in that order. How old were you when you started guiding? Robertson: About 19 I think. I’d worked on charters with Fofrich as kind of a boat cleaner/fish catcher for guys who’d partied too hard the night before. I looked like Opie (a young Ron Howard, from the Andy Griffith show) at the time. Early on, the biggest struggle was credibility. Here I was hanging around all of these legendary characters, and I looked like a skinny kid. Nowadays, l lot of bass pros are in their 20s. But back then, it was unusual. MWO: When I first came out to Erie in the early ’80s, no one was trolling. Initially, the Fofriches disparagingly called trolling “the T Word,” because everyone was casting weight-forward spinners. But I give Jim Sr. credit. He saw early on that it had real potential, and he forced himself to learn to do it. In 1982, he and Roach and I were likely the first ones to fish online planer boards on Lake Erie, and a year later, his team won the big LECBA tournament, at least in part by trolling. Nowadays, trolling is the primary way to fish on Erie, largely because the environment changed so much due to zebra mussels straining fertility and clearing the water. Robertson: The lake has really changed. Back then, the lake was more fertile, and there were a lot more fish. Nowadays, it’s much clearer, the top-end fish are bigger, but there aren’t as many of them. They’re a lot spookier. We often look for dirtier water to catch fish. Nowadays, trolling spinners is a big deal. Cranks are making a big comeback. Spoons aren’t used as much as they were a few years back. As conditions change, you have to adapt. You never stop learning. Want more of the Lake Erie “skinny” from Capt. Ross Robertson? You’ll find it in the podcast section at MidWest Outdoors.com. On the bottom of the home page, look for the button that says Podcast, click on it and you’ll find the interview. Look it up for June, where Ross details when to switch from trolling spinners to crankbaits, productive trolling speeds and strategies, how to find walleyes and interpret subtle signals when fishing big water, and more about open-water and basin trolling in general. Plus, a bonus look at catching giant smallmouth bass—even a few tidbits for ice fishing. 1987 7-year-old Ross is already putting walleyes in the boat. 1994 Ross begins working at a Toledo tackle shop, meeting pro walleye anglers. 1996 He begins doing well in local fishing derbies. 1997 Ross goes on the road to pro tournaments with Dave Hanson. 2006 Ross begins writing for major outdoor publications. 2009 Ross establishes bigwaterfishing.com, an educational web site for walleye anglers. 2013 Robertson and Curtis Niedermier co-author Walleye Trolling, a big-water troller’s bible. Dave Csanda has enjoyed 40 years in the fishing communications industry at In-Fisherman, Angling Edge and now, as associate editor of MidWest Outdoors. He is an inductee of both the Minnesota and National Fresh Water Fishing Halls of Fame, and maintains an active seminar schedule at sport shows.